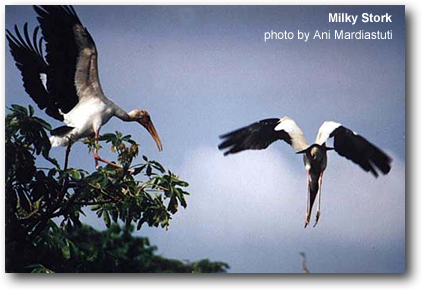 The Milky Storks, Mycteria cinerea, occur in Cambodia, Peninsular Malaysia and the islands of Sumatra, Java, Bali, Sumbawa, Sulawesi and Buton, Indonesia. This large wading bird measures about 97 cm in length. The plumage is mostly white except for the featherless red race and long, shiny, green-black tail and wing feathers.